Delicious Details To Make Your Wedding Day Pop! Love. How does one adequately articulate what it means to love something, or someone? How did you know when you found “the one?” At Engaged, we can’t resist hearing the stories of how our couples met and fell in love. As we work together to bring their wedding dreams to life, we’re always looking for ways large and small to tell not only their love story, but to show how much they love and value the people with which they’ve journeyed with to this happily ever after. While we always appreciate the power of a big gesture, we know it’s usually the small things that go the longest way in telling someone how much they mean to us. 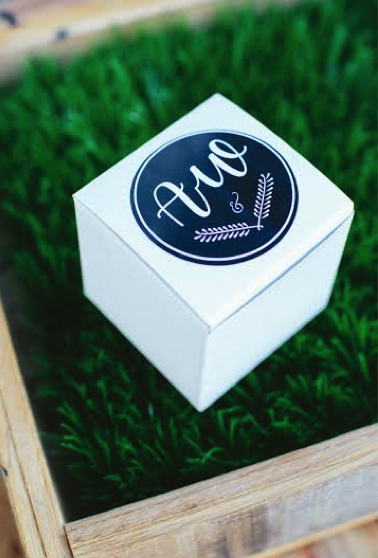 True, sometimes small things come in equally tiny boxes. But sometimes, they come in itty bitty bites. After all, you know what they say…. The way to a person’s heart is through their stomach. Food means fellowship. It’s what we prepare when we gather together to celebrate both big occasions and everyday blessings. When you visit the Poppy headquarters, you’ll never ever find us without a snack to serve! From business meetings, to pre-wedding set-ups, to catching up with dear friends over a cold cocktail, we believe in offering a snack as our way of saying “thanks” to our clients and colleagues for sharing their time with us. And we bet you can guess which snack we prefer to dish out the most! 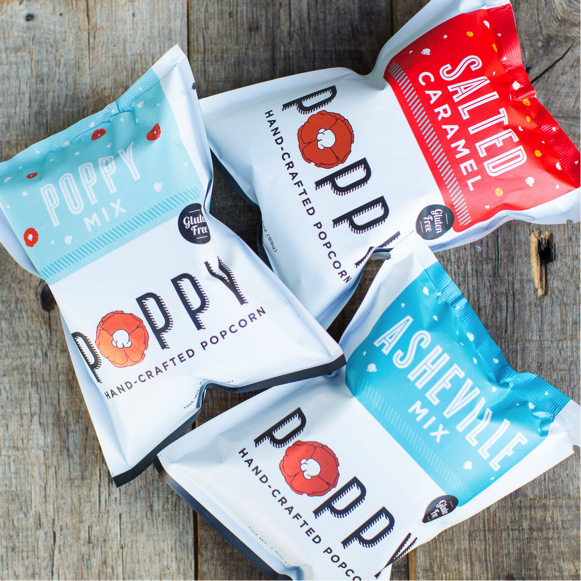 Poppy is a small-batch popcorn shop located in the heart of Asheville, NC! Using only non-GMO popcorn and non-GMO corn syrup, Poppy NEVER uses anything artificial to create our delicious popcorn. Why is that so important? Well, corn is on the top 10 list of items you should never buy if it’s been genetically modified, and treating your guests to only the healthiest, best-tasting treats available is a thoughtful gesture from the heart. There’s no bigger or more love-filled gathering than a wedding! Surrounded by people they’ve loved most of their lives, we know our brides and grooms want to throw a wedding that will POP! Details that show the couple’s personalities are what really sparkle in the minds and memories of their guests, and we’ve got some ideas on just how to do it! 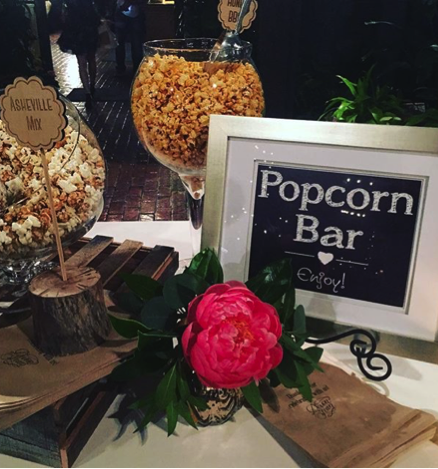 Serve guests a late-night snack with a popcorn bar! Picture this: dinner is over, the dance floor is “poppin’” (along with the bar), your guests are having fun and starting to feel famished…then voila! The popcorn bar is open! An easy-to-serve late-night snack is the perfect pick-me-up guests need to keep the party going. We customize our flavors and design styles to fit everyone’s palette and party. Trust us when we tell you, your guests will LOVE it! It’s a unique detail that shows an awareness of guest experience at the same time showing off your fun personality! Add local flavor to welcome bags! Another favorite idea of ours is adding Poppy to guest welcome bags. Leaving a little something to greet your guests upon check–in to their hotel is always a sweet way to welcome friends and family to your wedding weekend. Include a bottle of water, a map of the city, a handy schedule with dates and times for wedding events, and a snack to revitalize them from their trip! (If they don’t eat it right away, they’ll appreciate having something in their room when they get back from the big event.) 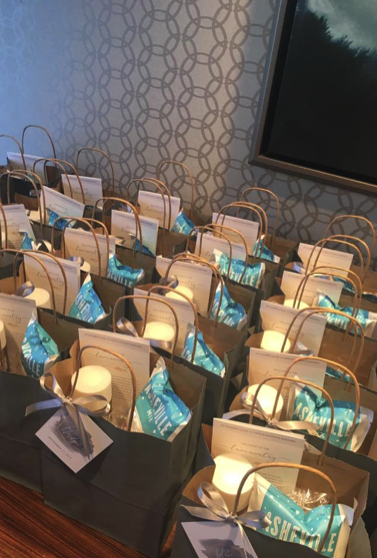 Welcome bags show your guests how much you appreciate how far they’ve come to celebrate with you. 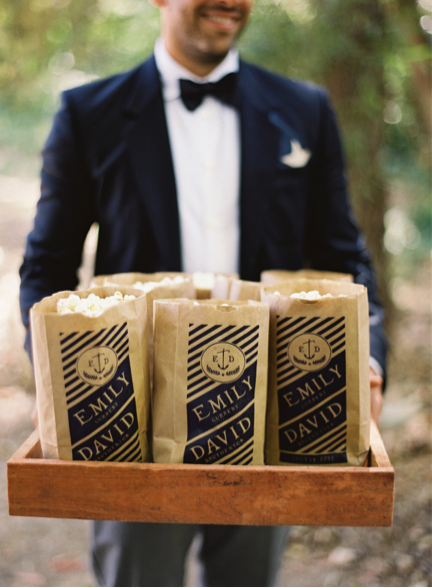 Whether you prefer a little snack bag, a personalized box, or a wine glass filled with popcorn, Poppy can do it! 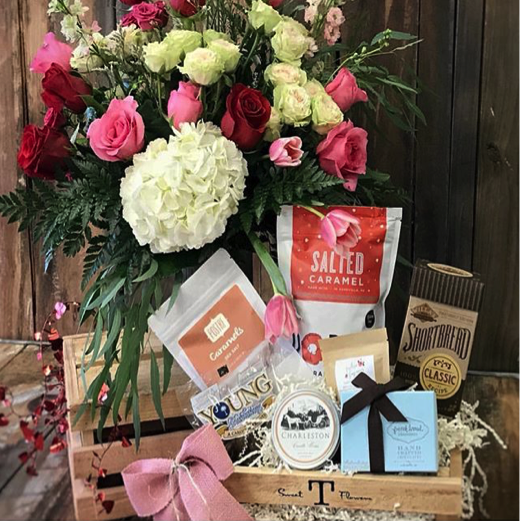 Destination brides love when we help them customize welcome bags to introduce their guests to the “flavor” of the town they may be visiting for the first time. Not only is our popcorn made in Asheville, it embodies the spirit of our locally-owned businesses that thrives here in our mountain town! 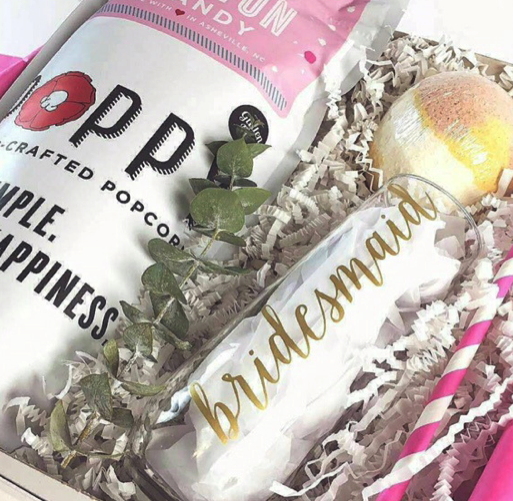 Sweeten up ‘thank you’ gifts for your bridal party and groomsmen! Need something sweet to thank your attendants for all the love and support they’ve given you along the way? Adding Poppy to your customized gifts is a great way to add a POP of color or flavor to your gift box theme. Want to create a pink-themed box with things that POP? 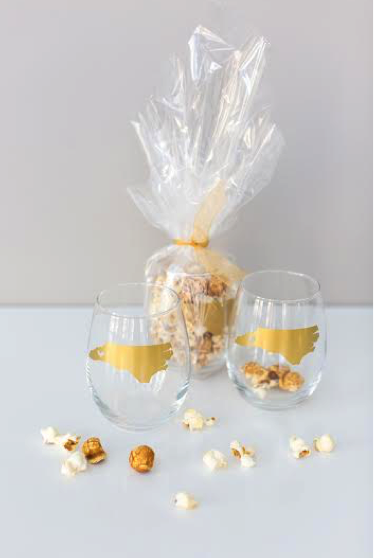 Include a split of champagne, a colorful straw, a personalized glass, and a bag of our Cotton Candy popcorn! 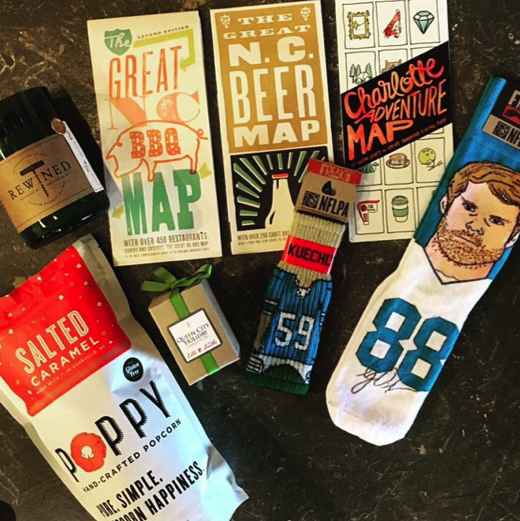 Groomsmen love themes ranging from food to football. 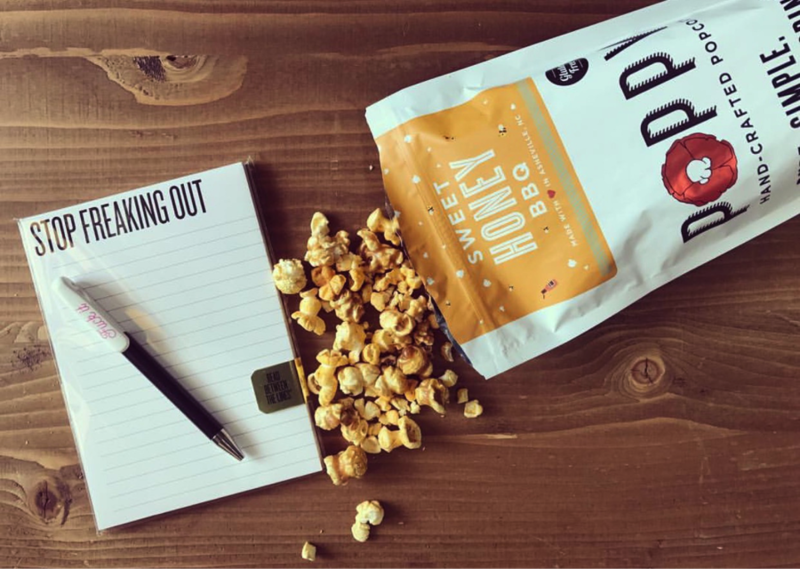 Include a bag of our Sweet Honey BBQ popcorn in your ‘swig and swine’ themed gift box alongside a locally-made BBQ rub and bottle of beer. If you share a love for a certain sports team, choose a bag of Poppy in your team’s colors to keep it visually tied together…and to give your boys a snack while the game’s on! 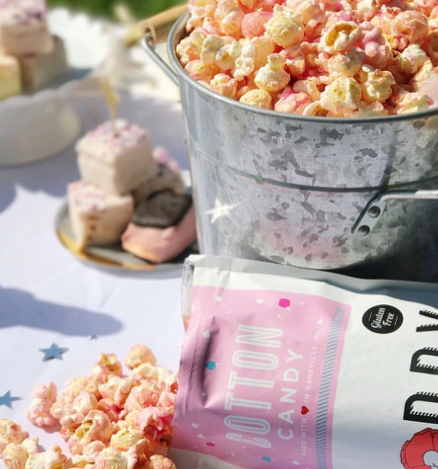 From receptions and rehearsal dinners, to welcome bags and bridal showers, Poppy Handcrafted Popcorn has something to make your special celebration even sweeter! We’re always ready to help you add a delicious dose of delight to your wedding day. 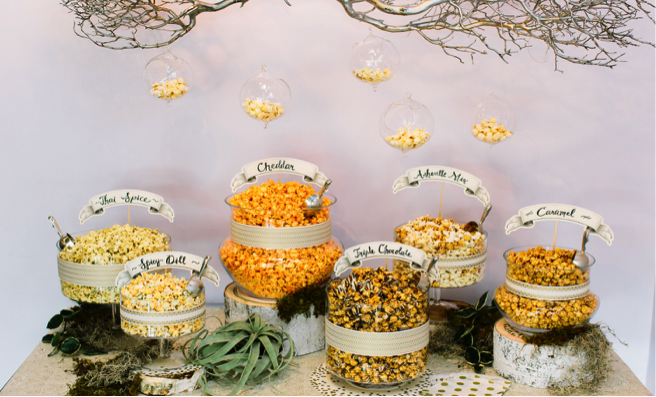 Popcorn bars and favors for weddings and events are our speciality. Add a little POP to your cocktail hour or your late-night dance party. 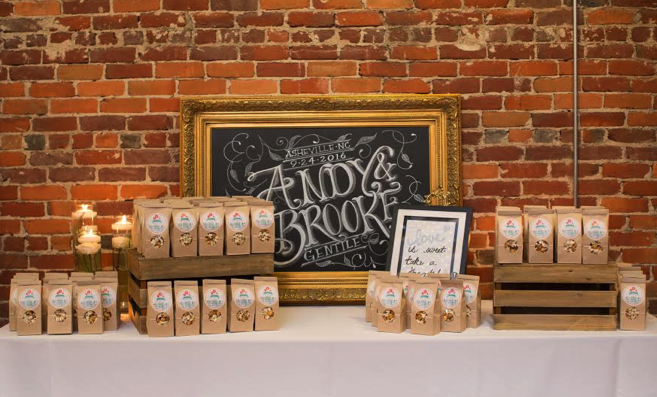 With several set-up options available, we can create the perfect bar or favors for you and your guests! Our popcorn is made with all-natural ingredients — nothing artificial ever! — and is always made with love right here in Asheville, NC! 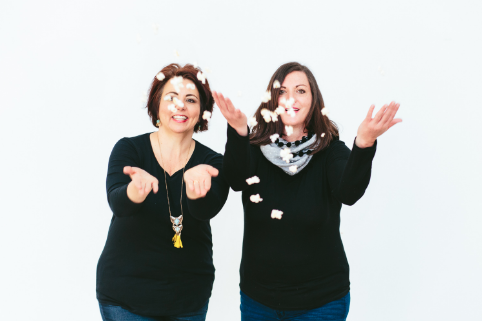 To learn more about Poppy Handcrafted Popcorn or to contact them, please visit their website. You may also refer to their profile on our Creative Team page.